Sophie Topping is going to throw a dinner for a dozen people and is working on the guest list, who to invite and more importantly; where to put them at the table? The book follows the dinner guests and the people they surround themselves with the week before the dinner. You have, among other characters; the investment banker who does an inside trade, the East European football player who has just signed for a minor Premier League team, the successful immigrants with their own pickle company and their son who is co-planning a terrorist attack, the literature reviewer who dislike the contemporary books he has to review and the solicitor who falls for one of his clients; the girl who accidentally hit someone while driving the subway train. I found this book to be a bit of a mess with all the characters and the fact that it never gets anywhere; it’s just a week in a lot of different people’s lives. 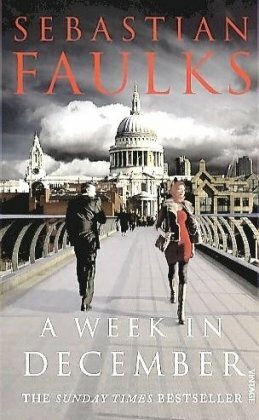 While reading the book, I thought that Faulks is trying too hard with his characters; they are all stereotypes and he doesn’t really succeed with his attempt to describe life here and now. This is my second attempt to read something by Faulks, I read Engleby two years ago and I had the same feeling of disappointment then. Yet, Engleby is one of the books that most often pops in my mind from time to time. I will give Faulks a final try with Birdsong, eventually.